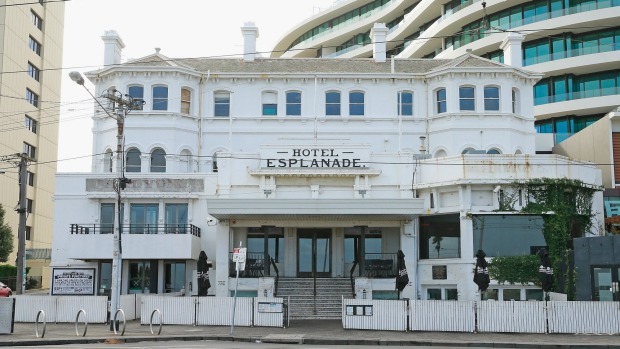 Privately owned hospitality group, Sand Hill Road bought The Espy in May 2017 and have spent the past eighteen months lovingly restoring the seaside icon to her former grandeur and glory, creating 12 bars, two restaurants and three stages across the expansive property. The group have looked to the building’s rich history, while being inspired by its future, to create a new pub and cultural destination where all Melbournians feel at home. “The Espy has always been our ultimate pub dream. But it’s also an awesome responsibility. Every day, we’ve uncovered layers and layers of The Espy’s history that have absolutely blown us away”, says Doug Maskiell, co-founder of Sand Hill Road. “We know we’ll never truly own The Espy – that title belongs to the many thousands of people who have walked its staircases before us, and the many more thousands still to come”. The ambitious design was a collaboration with Technē Architecture + Interior Design, who have worked with Sand Hill Road for the past ten years. Together they have brought to light the history and story behind the landmark venue by calling on different eras and styles across the spaces. One of their biggest sources of inspiration was The Espy’s most notable resident, Alfred Felton, a wealthy entrepreneur, art-lover and philanthropist who lived and died at the seaside hotel. Opening up parts of the building many never knew existed, the renovations expand the public offering from three levels to six, most notably by opening the top level originally lived in by Felton until his death in 1904. “There’s something about this hotel that captures the imagination like no other,” says Sand Hill Road co-founder, Tom Birch. “These are the things we determined to keep at the forefront of our minds as we conceived the look, feel and spaces of the new Espy – age, grandeur, history, arts – and respect for what it took to keep her alive all these years”. An operable glass roof opens up The Espy’s terrace entrance. On the ground floor, the foyer’s arch windows offer views into the Main Bar and iconic grand staircase, in front of which sits a stage in the round. Espy Kitchen, a cellar door-inspired dining area with lofted wine barrels filling the walls, sits between the main bar and a 1970s inspired Studio Bar built around a fully-fitted Podcast Studio, a space that patrons can book to record podcasts. A 120-person mezzanine-level function room offers sweeping views over the bay. Opening in early December, The Espy’s grand staircase leads you to Mya Tiger, the hotel’s Cantonese restaurant. Inspired by the Chinese cook-shops that sprang up throughout St Kilda during Victoria’s 1850s gold rush era, Mya Tiger will comprise a fast-paced dining room and sophisticated cocktail bar, with epic sunset ocean views. Continuing further up the hotel’s 140-year-old staircase, lies The Ghost of Alfred Felton, a stunning series of late 19th century rooms dedicated to Felton’s three great loves of knowledge, arts and science. On the broad-ranging interior design and decor Technē and Sand Hill Road worked closely with Sand Hill Road stylist, Eleisha Gray, to curate a selection of imported furniture and decorative objects that would further enrich the textural narrative. Accentuating the design is a series of hand-painted, period-style murals by Perth artist Desmond Sweeney (8 Foot Walls), including one filling an eight-metre wall in the artist green room. Slow roasted wagyu, pork chops, whole chicken and baby snapper come hot from the custom-built charcoal rotisserie and grill, while the wood burning oven serves up a range of pizzas made using 72-hour fermented pizza dough with South Australian stoneground flour. Espy classics – market fish and chips, cheeseburger, chicken parmigiana and veal cutlet schnitzel – are all served with chips and salad. On weekends, guests can kick off early with the brunch menu from 9am. Think an open crab omelette with spring onion and tomato, green nourish bowl with scrambled tofu and avocado, and BBQ mushroom and haloumi rolls serviced alongside a selection of fresh and punchy cocktails sure to get the day going. Kevin Peters, Sand Hill Road Group Bars Manager, and Matt Skinner, Group Sommelier, have developed a comprehensive drinks programme for the venue. Cocktails were created with a coastal sensibility to befit the seaside setting, like the Sun Sparkle Sour (vanilla Absolut, passionfruit, lemon, egg white and sparkling wine) and 500 Days of Summer (Four Pillars Sticky Carpet Gin, Fiorente elderflower, lime, strawberry, mint, ginger beer). “Local craft beers, such as the stunningly successful Balter XPA, will sit alongside unpasteurised Carlton Draught delivered direct from the bright tank in Abbottsford. Beers and ciders have been sourced both locally and globally to provide for the full range of palates The Espy lives to serve,” says Peters. Turning to wines, The Espy wine lists will balance great producers with great value. “I want the lists to be exciting without being too challenging, accessible without being dull, and diverse enough that were will be something for everyone. But most of all, I want the lists to make you thirsty,” says Skinner. The duo have also spent the last six months developing an impressive aged barrel drinks programme, with spirits and cocktails made on site in 28L custom-made barrels in The Espy’s own ‘rickhouse’. The Espy negroni, for instance, is made in American oak wood barrels, before being treated with Tawny Port for two months, aged for four weeks and bottled on site. The Gershwin Room will also expand its vision and host film screenings, including Claudia Dalimore’s critically acclaimed ‘Her Sound, Her Story’. “The Espy is an iconic venue for Australia’s musical landscape. The stories that this venue could tell from the legendary performances alone are enough, everyone from Beasts of Bourbon to King Gizzard and the Lizard Wizard! Now is the chance to welcome back those acts that hold amazing history with the venue but also find the next crop of artists that will come to dominate the touring circuit,” says Venue Program Manager, Shaun Adams. St Kilda has long been a hub for Melbourne’s vibrant emerging and established arts scene. The Espy’s Artistic Director, Janenne Willis (former Chair of Next Wave Festival and independent artist) will draw together a seasonal cultural programme aimed at continuing this legacy long into the future. The Gerswhin Room will host dance classes for adults and kids each week and be open as a space for artists to hire every Monday. Ghost tours will uncover paranormal encounters of the 140-year-old building and the little heard story of arts philanthropist Alfred Felton will be told through the lens of his former home. In the new year, Swell, an ambitious blend of live-music-meets-art will launch as the first ever immersive show to allow audiences to choose their own adventure through the hotel, while previously sold-out multi art form festival We’re All Going Die will make its debut in Melbourne prompting punters to fear less, live more. Further details to be announced soon. For Sand Hill Road, the opening of The Espy is as much of a celebration of St Kilda as it is the venue itself and the group is thrilled to be part of the area’s thriving future. “We want The Espy to stand as it has, for another 140 years, watching every sunset come and go. It will revive the stories and legends of Alfred Felton. Its stages will be alive again with the shredding guitars of new myths to be created. Our excitement for St Kilda lies in its own surge to retake the mantle of Melbourne’s true beachside playground. It’s what it’s always been, and now always will be. St Kilda’s restaurants, cafes, bars, boats, running tracks and tramways are the stuff of any city’s dreams. We’re excited that the St Kilda spark has been rekindled – eyes wide open and ready to play!” says Doug Maskiell. Further details on Mya Tiger, The Ghost of Alfred Felton and the summer music programme will be announced soon.